Ahemdnagar (Maharashtra), 05-August-2018: Farmers find in goats a vast potential for their socio-economic upliftment. Women are found to be particularly more inclined towards goats. 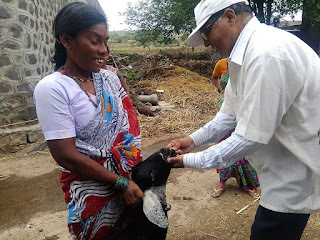 Therefore Bosco Gramin Vikas Kendra is implementing Goat Based Livelihood Project at Ahmednagar - funded by VAN AMERINGEN FOUNDATION. 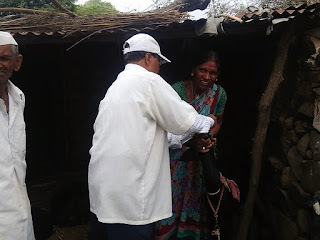 It is designed to support livelihood promotion for women through goat rearing among women Self Help Groups (SHG) at Ahmednagar district. 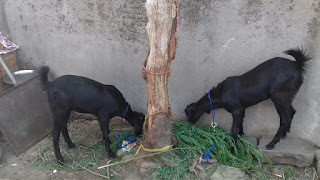 Goat based livelihood program is an endeavor to supplement the incomes of rural families through the introduction of better rearing and management practices, particularly related to healthcare, feeding and breeding of goats. Goat based Livelihood project will cater to 36 women from Self Help Groups and 72 goats will be distributed to these women. This project will establish 36 goatery units in the rural villages. This project will train people in goat management which will help them to reduce mortality in goats, improve breed quality and productivity, enhance, diversify and stabilize family income and facilitate access and control for women over resource and income from goatery. Bosco Gramin Vikas Kendra as a part of Goat Based Livelihood Project organized a training programme on management of Goat Rearing on 5th August, 2018. Altogether 36 women participated in this training programme. The training programme aimed at improving the goat husbandry practices- feeding, breeding and health. Drs. Dinesh and Mr. Dattatrey Gaikwad were the main resource persons for the training. The women were very grateful to the organization for organizing the training programme.